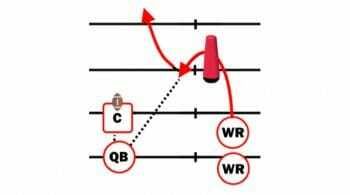 The “Over The Shoulder Catch” Drill for Wide Receivers is a great drill to really warm up the hands. It emphasizes the mechanics and techniques used when catching a deep ball and also reinforces the importance of keeping your eyes on your hands and the ball. So many times, deep balls are dropped because the receiver takes his head off the football. On the deep ball, you want the ball to be caught high, with the hands and the ball inside the same frame of your view. I like to tell my wide receivers that when you catch a football, especially an over the shoulder catch, you want to paint a picture frame, and within that frame you need to see the football and your hands catching the football. And usually, if our hands and the football are in the frame and your eyes can see that picture, usually you are going to catch the football. 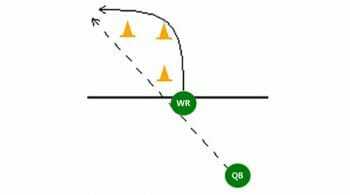 For more great drills for wide receivers, plus tips, techniques and a lot more, be sure to Become a Fan on Facebook! You can also Follow Me on Twitter and Hangout with Us on Google+!